Hey hey! If you follow me on Instagram or read my Unblogged Files, you know that these days, my usual breakfasts are: yogurt with fruit and granola, acai bowls, oatmeal, cottage cheese on toast, that kind of thing. So I pretty much always have the ingredients for those breakfasts on hand. I happened to be working from home one day last week, and because I was saving time on the commute (and you know, not needing to apply make-up, brush my hair and all that jazz), I thought I might step up my breakfast game, using my usual breakfast ingredients in a special way. Enter these pancakes! I've had the idea of cottage cheese pancakes lurking in the back of my mind for a while - syrniki and blintzes have been on my to-do list forever - but I've also been meaning to make the healthy kind, the type that seems to keep popping up on health and fitness blogs, made with eggs, oats and cottage cheese. As I said above, I always have those ingredients on hand, and on this particular morning, I also had an overripe banana in the kitchen that had been staring at me disapprovingly for a few days. 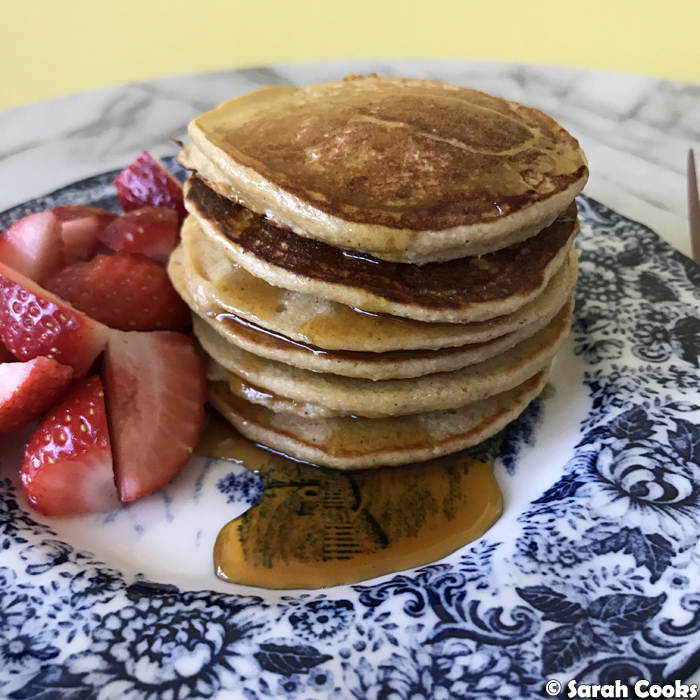 I searched for a pancake recipe pancakes with cottage cheese, oats, eggs AND bananas in it, found a nice-looking one on Ambitious Kitchen, and it was on like Donkey Kong! These were super easy to make - just put all the ingredients in the blender and then cook! 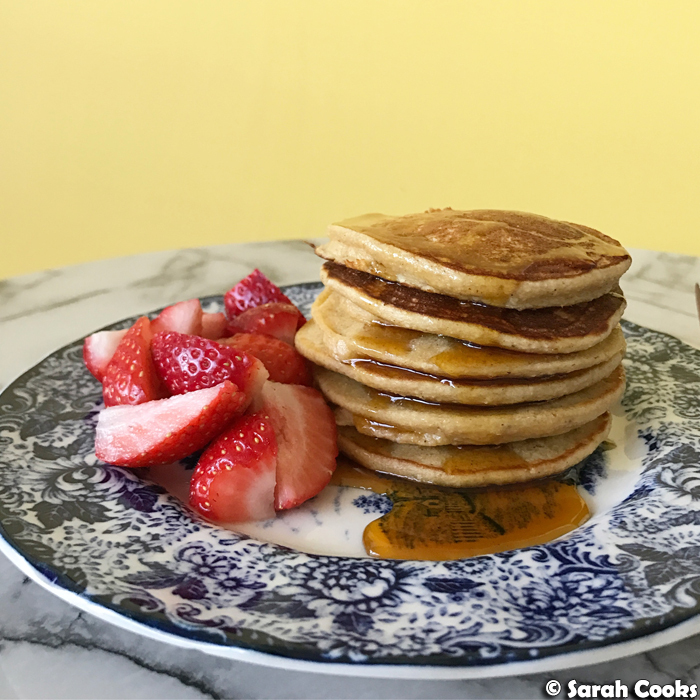 In addition to the bananas, oats, cottage cheese and egg, these pancakes have a little cinnamon and vanilla for flavour, plus a little baking powder for lift. I fried them in butter because butter is life! But if you wanted to keep in with the health and fitness theme, I guess you could just fry them in an un-oiled non-stick pan, or use whatever oil the health gurus are promoting these days. 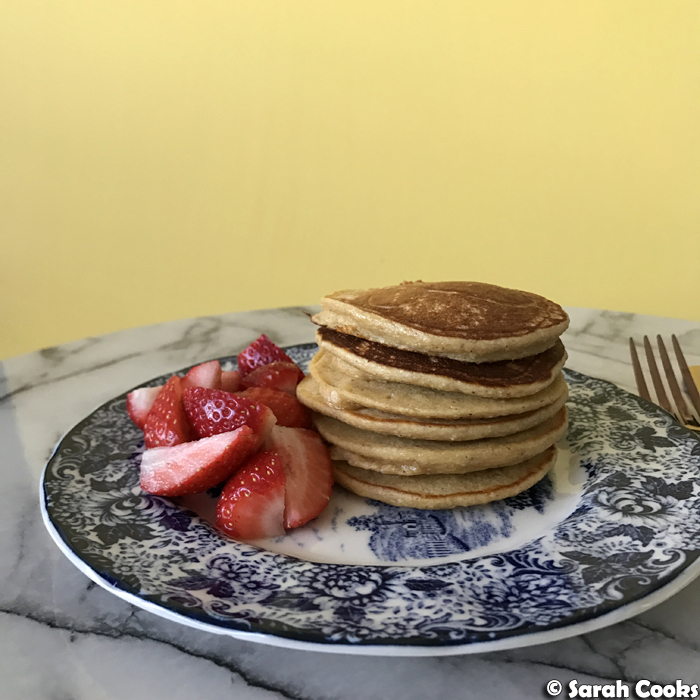 This recipe makes just one generous serving (1/2 cup oats, 1 egg, 1/4 cup cottage cheese, 1/2 banana), but you fry them in teeny tiny pikelet size you get a whole stack of pancakes to yourself. Woohoo! I served them with juicy red strawberries for extra freshness, and lots of maple syrup. 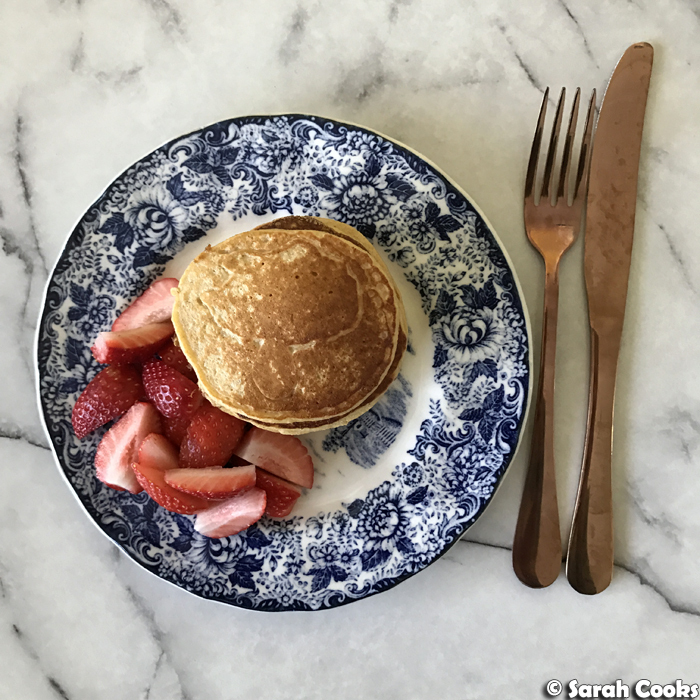 These pancakes are so yum! They're nice and squidgy and moist, but not at all dense or heavy, as some "healthy" pancakes tend to be. 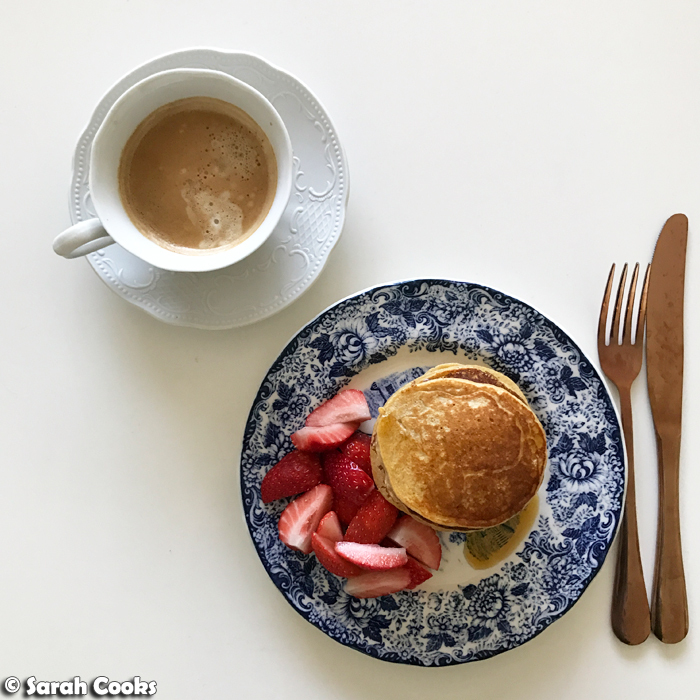 Despite feeling like a sweet treat, these pancakes are very high in protein (the cottage cheese and the egg! ), and they kept me full until well past my usual lunchtime. Winner! I'm told that these make a good post-workout breakfast, but y'all know I've never been able to work out without eating beforehand! Place all the ingredients in a blender and blend until completely smooth. Allow to sit for 5 minutes, while you heat a non stick frying pan. Melt a little butter in the frying pan. Cook the pancakes, using two tablespoons of batter per pancake. Wait until the base is cooked and bubbles appear on the top, then flip, and cook for a further minute. Place on a plate and cover with foil to keep them warm while you cook the remaining batter.